Three (3) nights accommodations; two (2) nights in London (pre/post) and one (1) night with choice of B&B or Hotel in Cirencester. Arrival and departure transfers in London. Two (2) days of custom touring. Pre and post nights are based on Grange Hotels / Park City or or similar. Hotel is on a request basis. If necessary, a hotel upgrade may be necessary. Your booking agent can advise this at time of booking. Property in Cirencester will be advised once confirmed by our UK supplier. Arrive London; Shared transfer to your hotel is included. You are free to enjoy this beautiful city on your own. (Please note, hotel check-in is generally between 2:00 pm and 4:00 pm. If you are arriving into London early - the hotel should be happy to hold your luggage until your room is ready). Departing from Stance 3, Greenline Coach Terminal, Bulleid Way, Victoria, the London departure point by 8:45 am (unless optional transfer was purchased at time of booking). Tour departs promptly at 9:00 am, where we first travel to the pretty village of Avebury. Here we will be able to wander amidst the largest stone circle in the world and a World Heritage Site. Nearby is also the site of the Cherhill White Horse, which was cut out of the chalk hillside in 1780. 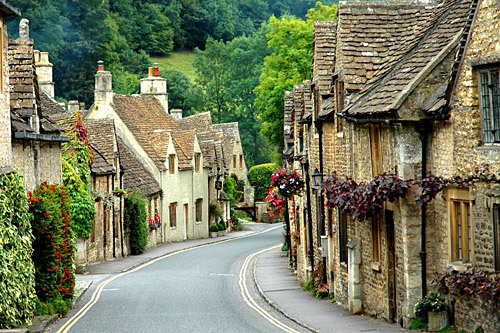 Not far from here, set in rural Wiltshire, is Lacock village, famous for its picturesque streets, historic buildings. The Abbey, located at the heart of the village within its own woodland grounds, is a quirky country house of various architectural styles. We spend some time in the afternoon in Bath, suffused with relics of its Roman past and of course its famous Bath. From here we continue to Cirencester, set in the heart of the Cotswolds, which is so quintessentially English. Cirencester was the second largest town in Britain during Roman times! We will discover some more of the Cotsworld scenery and villages. We will see some outstanding countryside with river valleys, water meadows and beech woods, sleepy ancient limestone villages, historic market towns and for being so ‘typically English' where time has stood still for over 300 years. Our visits will include Bibury a picturesque village with many of the traditional features unique to this area. Our visits will include Bourton on the Water, also known as the ‘Venice of the Cotsworlds. 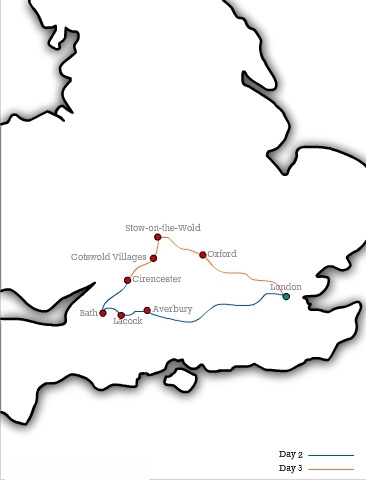 Next stop will be Stow-on-the-Wold, the highest town on the Cotsworld and packed with charming traditional houses. In the afternoon we visit Oxford, renowned for over 900 year as a center of academic excellence. Discover at your own pace the college courtyards, unspoilt narrow alleys and the historic town square. Harry Potter fans might want to see Christ Church, where many scenes from the films have been shot. The grandeur of the Great Hall has formed the basis of Hogwarts Hall! Later that day we return back to London and make your way to your pre-booked hotel (unless an optional transfer back to your hotel was purchased). After breakfast, shared transfer from your hotel to the Airport for your return flight to the U.S.